Annoying tree stump or water pump ruining the look of your yard? This Outdoor Essentials® Extra Large Rock is tall enough and wide enough to cover those bad boys. This fake hollow rock is made of durable fiberglass composite, but can be drilled for vent holes or to run hoses and wires. Also, it looks real so you can use it in place of a real rock in your yard and no one will know. (We won’t tell, promise). And since it only weighs 11.5 pounds, it is easy to move and install all by yourself. As with all our fake landscape rocks, it is coated with a UV-resistant finish for color protection. 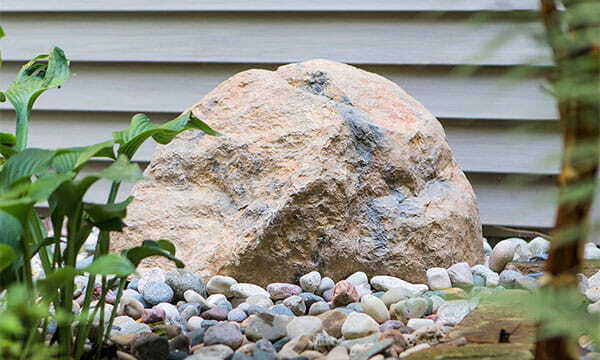 Other uses for this awesome rock are covering up electrical boxes, septic cleanouts, and any other unsightly thing in your yard or garden. These extra-large rocks, extra rock!